The ES8000, also known as the V-lock is a high torque motorized bolt that moves from the vertical position to the horizontal state when locked. The bolt moves into the V shaped strike plate pulling the door aligned with the lock. The high torque motorized bolt can be concealed from view or surface mounted and has the worlds first fail-open motor locking mechanism. Slim design with classic satin stainless steel face plate, and significant +/- 3.5mm door misalignment tolerance make ES8000 a product with great aesthetic appearance as well as easy installation. The ES8000 lock will unlock with up to 15kg of side pressure thanks to high torque motorized locking and unlocking when wired in 3 wire mode. The lock is Power to Lock (Fail Safe) / Power to Open (Fail Secure) field configurable. High speed operation - unlocks in less than one second. Interior doors can be mounted vertically or horizontally. 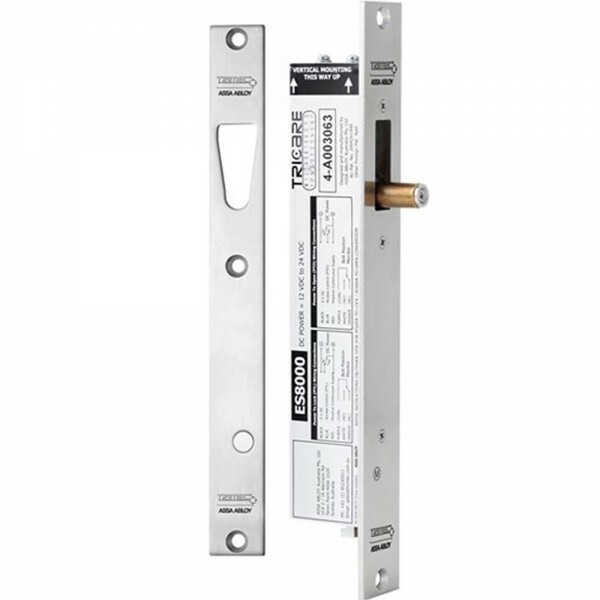 For exterior doors due to possible water ingress the ES8000 must be mounted horizontally. The lock must be used with the supplied strike plate as it contains a magnet to ensure proper alignment of lock and strike.